Chronic stress damages cells and organs, and promotes dysregulation across organ systems. When the organism fails to function as an integrated system, this causes disease. ​Evidence suggests that mitochondria are sensitive to various stressors, which cause maladaptive structural and functional changes in response to chronic stress. This is termed mitochondrial allostatic load (MAL). 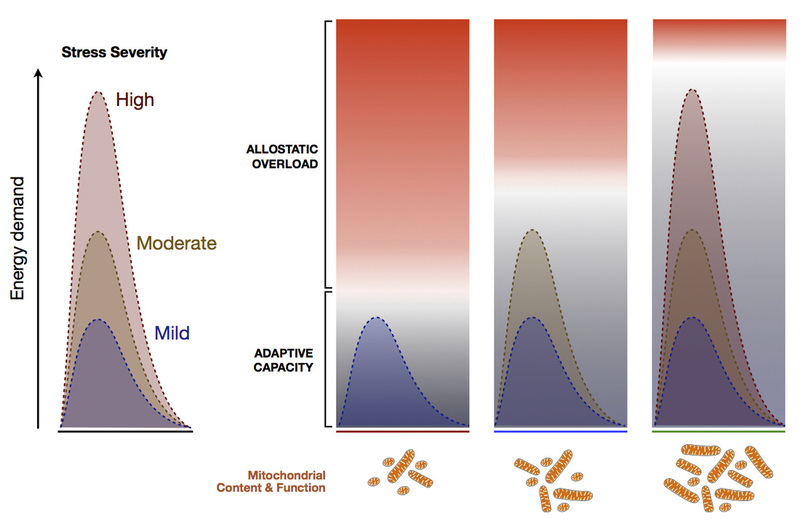 We study the effects of acute and chronic stressors on mitochondria as a component of the stress-disease cascade. During stress, mitochondria also release their mtDNA, which can be detected in the bloodstream as circulating cell-free mtDNA (ccf-mtDNA), or circulating mitochondrial genome (CMG) fragments. The mitochondrial phenotype is the integrated sum of mitochondrial structures, molecular composition, and functions. The mitochondrial phenotyping platform for human blood cells developed in collaboration with Yan Burelle combines biochemical and molecular techniques in fresh and frozen cells and tissues.